The papers of the Malloy family of Cheraw, South Carolina, chiefly comprise wartime letters from George Archibald Malloy (1843–1923), who served with the Confederate Army in the Ashley Dragoons, Company H, 3rd S.C. Cavalry. 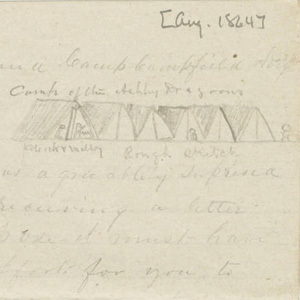 George’s letters record the tedium of camp life amid reports of troop movements, rumors about Union and Confederate officers, and travel notes. After being stationed at Grahamville, South Carolina, throughout 1862, he moved with his company briefly to Johns Island before beginning operations in southeastern Georgia in 1864. The collection also includes wartime letters from three of George’s brothers. Charles Alexander Malloy and J. Randolph Malloy were encamped near Richmond, Virginia, and Edwin F. Malloy served in North Carolina. Postwar items include correspondence from acquaintances of the family, an invitation to an Ashley Dragoons reunion, and various receipts.